I do not know the complete story about the Wenger Realtree Hardwoods. We know the story with Bill Jordan and the Realtree systems. This he introduced in the late 1980s or from 1986. Already in the early 2000s Wenger had a big selection of knives with the hardwoods system invented by Bill Jordan. Included the old Ranger knives are shown. This is extra interesting for me because this again tells me a story about Wenger scales. I like it! It is important how Wenger make the handles much more versatile by such innovations. I am sure the Delemont factory got or has used different production methods making the patterns but it is for sure something Wenger did build further on. I have talked some before about these systems and how Wenger did use or use them. I would really appreciate if you have further information for me. The hardwoods, AP Blaze and Snow camo systems are a big success on Wenger knives. The knife in the middle is a Hardwoods New Ranger by Wenger. 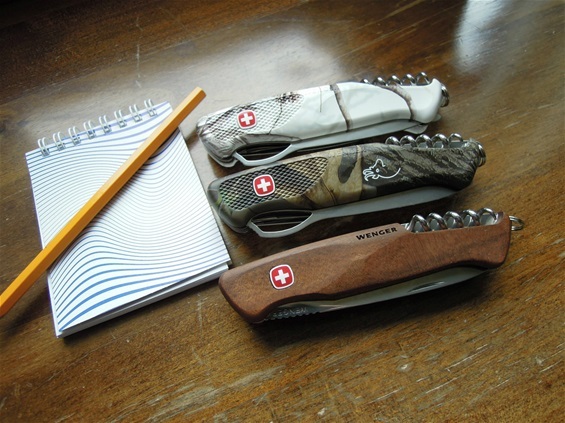 If you take a look at the Wenger 2002/2003 catalogue then you can see some of the Hardwoods knives and the Advantage system by Bill Jordan with four camouflage patterns in one.